In the series of its negative standpoints to the rehabilitation of the old Jewish cemetery in Prostějov, the town council has made another serious and quite incomprehensible misstep. The entire fragment of the original historic wall has been demolished as part of the building project conducted by the council in the immediate vicinity of the cemetery, although the Ministry of Culture declared the cemetery a heritage site in early July. 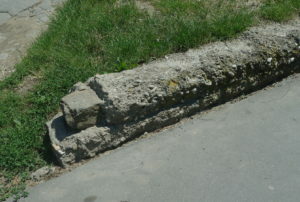 Destroyed fragment of the historic cemetery wall, which was planned in the rehabilitation project for the installation of the discovered parts of gravestones (Matana archive). “Although the proceeding to declare the cemetery a heritage site, against which the municipality lodged a remonstration in due time, is still under way, the Prostějov council has had a part of the cemetery razed ruthlessly,” reported Tomáš Jelínek, representing the American benevolent foundation Kolel Damesek Eliezer, which has struggled for the rehabilitation of the cemetery since 2013. “The steps made by the council can only be seen as utterly arbitrary acts, by which the municipality torpedoes all efforts to mitigate past wrongdoing. No substitute excuses offered by the mayor in this respect simply do not hold water. The town is the owner and investor, so it is fully accountable for the present situation,” concluded Jelínek, who initiated the declaration of the cemetery as cultural heritage. Based on the facts found, the Ministry of Culture initiated administrative infraction proceeding. “The Ministry received on August 1, 2016 a motion to prevent harmful activity, stating that works were conducted on the site of the old Jewish cemetery, cadastral lot No. 3104/1, in Prostějov (Prostějov District, Olomouc Region), which, according to the video evidence furnished, were significantly harmful to the above object, notably the fragment of the boundary wall of the cemetery. It is fair to say it has been destroyed. Thus [the council] has breached the obligation of which it was notified by the letter of June 2, 2016, ref. No. MK 38113/2016, as follows: ‘Till the end of the proceeding, of whose result we shall inform you, the owner is obliged, as provided in Section 3, Par. 3 of the above National Heritage Protection Act, to protect the object against destruction, damage, or asportation, and to report to the Ministry of Culture any intended or realized change of ownership, administration, or use thereof,’” reads the document addressed to the municipality of Prostějov. The old Jewish cemetery was destroyed by the Prostějov administration in 1943. The gravestones were sold as building material to the population of the town and villages in its neighborhood. A number of the gravestones have been found in the last year. The American foundation Kolel Damesek Eliezer, in cooperation with the Czech Federation of Jewish Congregations, has been striving to rehabilitate the cemetery, using its own resources.